OnePlus is expected to launch its next flagship smartphone - OnePlus 7 by May this year and we have already seen several leaks already. Previously, we reported that OnePlus 7 had been listed online ahead of the launch with a price tag of $569. The online listing reportedly revealed not only the pricing but also basic specifications of the device. Going by the market reports, OnePlus 7 will be featuring a pop-up selfie camera, similar to the one seen on Vivo V15 Pro and Oppo F11 Pro. 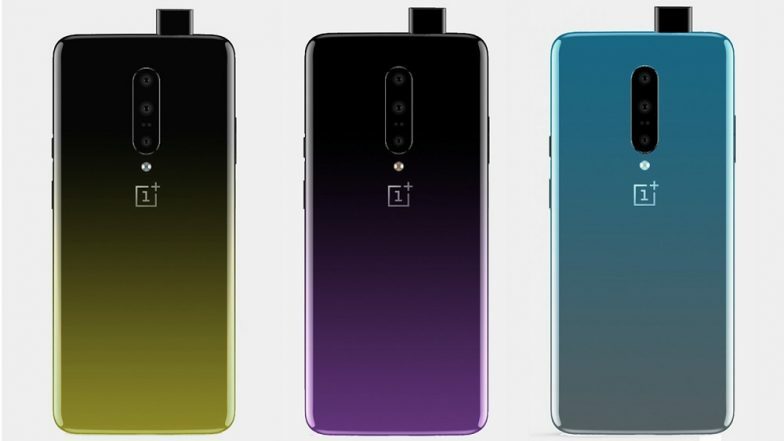 Moreover, new leaked render image surfaced on the internet revealing that OnePlus 7 will sport new gradient colours. OnePlus 7 Already Listed Online With Price &#038; Specifications Ahead of Launch. The leaked image confirms three new gradient finish design at the rear including Black Yellow, Cyan Grey and Black Purple. The overall design of the handset is pretty much similar to the device we have seen from Vivo and Oppo. The leaked images also confirm some of the critical specs which were previously leaked that includes triple rear camera setup and pop-up selfie camera. OnePlus 7 Flagship Smartphone Not Coming With Wireless Charging, Says CEO Pete Lau. It is evident from the images that the phone will be sharing its design aesthetics with Vivo & Oppo, as the fact, all the three companies are owned by the same parent company - BBK Electronics. As per the report from T3, it is speculated that the design sharing will be carried over at the back of OnePlus 7 too. New OnePlus 7 Render Images Leaked Online; Reveals Pop-Up Selfie Camera & Triple Rear Camera. As far as the specifications go, the forthcoming OnePlus 7 will be the first device from the Chinese phone maker to sport a triple rear camera module. The setup will comprise of a 48MP primary sensor along with 20MP and 16MP sensors. However, the device will get a pop-up camera which is expected to be a 16MP sensor. Powering the device will be the latest version of the chipset from Qualcomm- Snapdragon 855 SoC which is likely to be mated with up to 12GB of RAM and 256GB of internal storage. The Chinese smartphone maker is expected to launch the new OnePlus 7 flagship phone in the next couple of months.